Hip No. 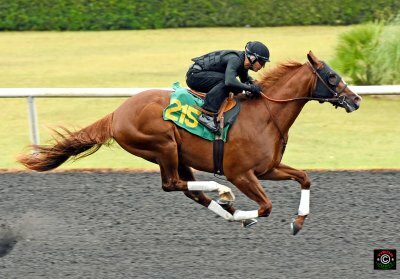 215, a chestnut colt by Gemologist consigned by Top Line Sales LLC, Agent, worked an eighth in :9 4/5, the fastest work at the distance at the second session of the Under Tack Show for the Ocala Breeders’ Sales Company’s 2016 June Sale of Two Year Olds in Training and Horses of Racing Age. He’s out of Distant Storm, by Storm Cat, from the family of champion Outstandingly. Nine horses worked eighths in :10 flat. Hip No. 214, Leslie’s Moon, a dark bay or brown Gone Astray filly consigned by Rancho Monarca LLC, is out of Disperse a Star, by Dispersal, a half sister to Japanese stakes winner South Vigorous. Hip No. 260, consigned by Bobby Dodd, Agent, is a chestnut colt by Super Saver out of Emosewa, by Smarty Jones, a half sister to graded stakes placed stakes winner Shashobegon. Hip No. 277, Yola Humor, a bay filly by Distorted Humor consigned by Omega Farm, Agent, is out of graded stakes placed Ex Caelis, by Fusaichi Pegasus, a half sister to stakes winner Le Rossignol. Hip No. 287, consigned by Pick View LLC, Agent, is a bay gelding by Ready’s Image out of Fallseed, by Forest Wildcat, a daughter of graded stakes placed stakes winner Numero Uno. Hip No. 310, consigned by RiceHorse Stables, Agent for Emerald Sales LLC, is a bay colt by Shackleford out of Flashy Future, by Bertrando, a full sister to grade one stakes placed stakes winner Lacquaria. Hip No. 316, Black Canary, a bay filly by War Front consigned by Woodford Thoroughbreds, Agent, is a half sister to stakes placed Joe Tess out of graded stakes placed Forty Moves, by Gold Fever. Hip No. 357, consigned by Top Line Sales LLC, Agent for Small Batch Thoroughbreds, is a dark bay or brown filly by Giant’s Causeway out of grade one stakes placed Grace Anatomy, by Aldebaran, from the family of champion Soaring Softly. Hip No. 359, a bay colt by Proud Citizen consigned by Mayberry Farm, is out of Gracious Sakes, by Langfuhr, a half sister to stakes winner House of Grace. Hip No. 386, a bay filly by Jersey Town consigned by All In Sales (Tony Bowling), Agent, is out of Her Holiday, by Harlan’s Holiday, a half sister to stakes winner Montero. Hip No. 204, a bay colt by Harlan’s Holiday consigned by Thoroughbred Champions Training Center LLC, is a half brother to grade one stakes winner Marylebone, out of Desert Queen, by Wavering Monarch. Hip No. 221, consigned by Southern Chase Farm, Inc. (Greg & Karen Dodd), Agent, is a bay filly by Dominus out of stakes placed Dixieland Baby, by Dixieland Heat. There were four quarters in :21 1/5. Hip No. 218, a dark bay or brown colt by Bodemeister consigned by Eddie Woods, Agent, is out of stakes placed Dixie Crisp, by Dixieland Band, and is a half brother to stakes winner Reconstruction and graded stakes placed Southern Freedom, third in the All American Stakes (G3) last week. Hip No. 339, consigned by Ocala Stud, is a chestnut colt by High Cotton out of Glamalert, by Vindication, a half sister to grade one stakes winner Swift Temper. Hip No. 348, consigned by Blue River Bloodstock, Inc., Agent, is a bay colt by Leroidesanimaux (BRZ) out of graded stakes placed Golden Silk, by Songandaprayer, a half sister to graded stakes winner Flag Down. Hip No. 378, a bay Tale of the Cat colt consigned by de Meric Sales, Agent, is out of Haute Couture, by Medaglia d’Oro, a half sister to graded stakes winner Get Funky. Four youngsters worked quarters in :21 2/5. Hip No. 212, a bay filly by Put It Back consigned by Blue River Bloodstock, Inc., Agent, is a half sister to graded stakes placed stakes winner Tropic Storm out of Diplomatic Angel, by Valid Appeal. Hip No. 274, a dark bay or brown High Cotton filly consigned by Peacock Ridge, Agent, is out of Ever Optimistic, by Elusive Quality, a daughter of graded stakes placed stakes winner Everhope. Hip No. 323, consigned by Grassroots Training & Sales LLC, Agent, is a bay filly by Lookin At Lucky out of stakes placed Freud’s Irish Miss, by Freud, a half sister to graded stakes winner Unacceptable. Hip No. 329, a bay filly by Biondetti consigned by Woodford Thoroughbreds, Agent, is out of Gale Warning, by Unbridled’s Song, a daughter of graded stakes winner Storm Mesa. Hip No. 398, a gray or roan filly by Mizzen Mast consigned by Longstride Training Center (Bill and Kim Deaton) worked the session’s fastest three eighths, clocked in :34 2/5. She’s out of Honeymoon girl, by Sligo Bay (IRE), a half sister to graded stakes placed Riveting Reason. The Under Tack Show resumes Tuesday morning at 7:30 a.m. Hip No.’s 401 – 600 are scheduled to breeze.